Your desk is where you spend most of your time, so it’s important to make it functional and pleasant. Before setting up your desk, ask yourself the following questions. 2. Is the computer monitor at a good height? 3. Is my chair comfortable, and is it supporting my back? 4. Is the phone close by? 5. What hand do I use to answer the phone? 6. What things do I use the most? The word “Ergonomic” comes from two Greek words “ergon,” meaning work, and “nomos” meaning “laws.” Today, however, the word is used to describe the science of “designing the job to fit the worker, not forcing the worker to fit the job.” If your desk was ergonomic your keyboard and mouse position will allow for a natural position of your wrists and arms. Your monitor will be eye level or below. The chair should have good lumbar support. If you use a laptop then prop it up with an adjustable laptop stand. With a proper desk and chair you can prevent repetitive stress injuries. Learn more on how to ergonomically optimize your workspace. I answer the phone with my left hand so I positioned the phone on the left. I sometimes have to type while talking to a client so I use a headset. No more neck problems from using my head to hold the phone. Do you do that? Keep things you use frequently within arms reach. I don’t like the typical in/out box concept. It may work for you but I do have a to-do box and then a file box. All papers pertaining to what I’m working on go in the to-do box. Then when they need to be filed I either file them or put them in the file box to file later. Think about working from left to right. Another handy item is a small box to corral the miscellaneous items so they don’t litter your desk. You will need the essentials near by: stapler, paper clips, tape dispenser, calculator, pencil/pen cup, notebook and a small box to store recently acquired business cards. Make a list of things you use daily and plan-out the desk. If your desk doesn’t allow for ergonomics, invest in one that does. 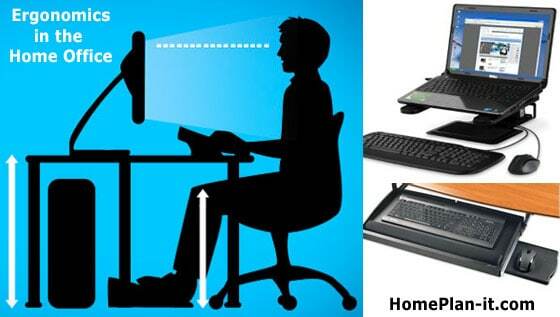 It may be a simple fix like installing a keyboard tray under the desk to drop it down to the right height. Final thoughts, keep it clean and healthy. Practice new habits to keep it that way. That is the subject of the next and last week of the organizing challenge, Maintenance! 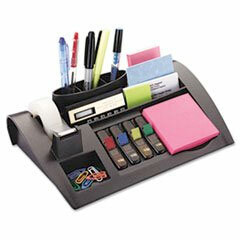 Creating a daily system to keep your home office organized, functional and beautiful.